Find list of florist, flower shops and flower delivery services in and around Riverside California. Riverside area code covers here : 92508, 92506, 92505, 92503, 92504, 92501. Services : Flower Delivery To Riverside, CA. Sat : 9:00 AM – 12:00 PM, Sun : Closed. Services : Flower bouquets, floral arrangements for any occasions including weddings, funerals etc. Local and international flower delivery services. In-store (walk in’s welcome) and online florist in Riverside CA 92506. 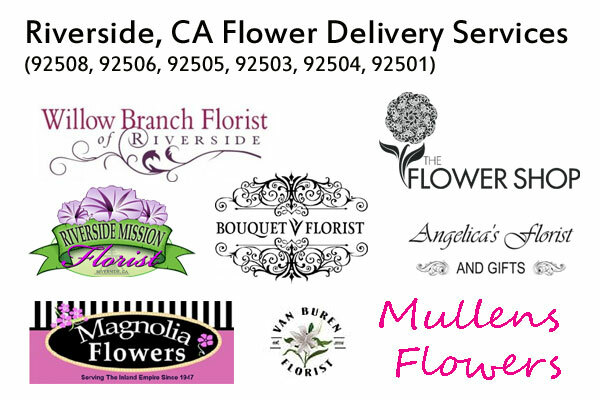 Services : Flower delivery throughout Riverside, CA and surrounding areas. Services : Flower bouquets in-store and online. Flower delivery service in Riverside CA 92501. Services : Same day flower delivery Riverside. Sat (10:00am – 2:00pm), Sun : Closed. Services : Flower shop, floral arrangements and flower delivery services in Riverside CA. Services : Flower delivery and floral arrangement services. Services : florist in-store and online, local flower delivery services. Services : Hand-arranged fresh flower delivery today in Riverside, CA. Services : Custom floral bouquets, event flowers and flower delivery. Services : Same day flower and gift delivery in Riverside. Services : Floral arrangement and flower delivery in Riverside CA.